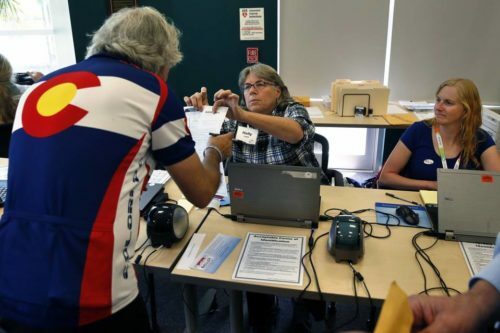 AURORA, Colo.—Hispanic voter registration is hitting record numbers in several key states, including battlegrounds like Colorado, at a time when polls show Republican presidential candidate Donald Trump struggling to gain traction with those voters. Mr. Trump drew 22% Hispanic support in the most recent Wall Street Journal/NBC News poll, taken in June, compared to Democratic candidate Hillary Clinton’s 69%. A Pew Research Center poll released last week showed Mr. Trump with 24% Hispanic support nationwide versus Mrs. Clinton’s 66%.